Faculty can now add multiple position titles to the Profile Form, and change the order in which the position titles display. Secondary unit assignment titles are now included with position titles. Only the first position title displays on vitae. On the Faculty menu, click Profile, then click Current Position. The Current Academic Rank and the position titles that are already included in the Profile Form display. Click Edit. You now have the option of changing the order of the current position titles, editing/deleting a position title, and adding an additional position title. In addition, multiple position titles can now be bulk uploaded. The Position Title and Date Started fields are no longer included in the Faculty upload form. A new upload form called Current Positions must be used for uploading multiple position titles – the Date Started field is available in the new Current Positions upload form. In the Configuration section, click Upload Form. In the Data to Upload section, select Current Positions. The FACULTY180 API now includes a GROUPBY parameter that allows grouping by faculty. This makes it easier to identify faculty members when performing a search. The returned information is the activity ID. Staff accounts are now called Support Accounts. This helps distinguish between faculty accounts with a Staff Employment status and a non-faculty account. In addition, a new access level (Limited Access) is available for support accounts. This access level allows access to the faculty member’s menu only – evaluation data for the faculty member is restricted. When an attachment is uploaded in a section, the date that the attachment was uploaded now displays. If an attachment that is uploaded overwrites a previously uploaded file, the date displayed for the upload changes to the new upload date. Evaluations reports now contain a faculty selection tool. This allows administrators to filter report results based on selected faculty members only. In the Administrative Report section, click Evaluations. The faculty selection tool displays. 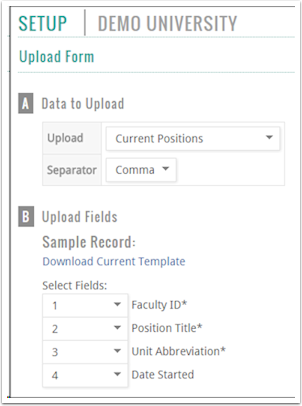 Secondary unit assignments, if applicable, now display in the Profile Form, Activity Input Form, Vitae, and custom help screens, after the primary unit assignment. Activity classifications associated with secondary unit assignments display as well.